It's March 1997. A woman has her throat cut behind a bar in Carter Crossing, Mississippi. Just down the road is a big army base. Is the murderer a local guy - or is he a soldier? Jack Reacher, still a major in the military police, is sent in undercover. Her investigation is going... read full description below. It's March 1997. A woman has her throat cut behind a bar in Carter Crossing, Mississippi. Just down the road is a big army base. Is the murderer a local guy - or is he a soldier? Jack Reacher, still a major in the military police, is sent in undercover. The county sheriff is a former U.S. Marine - and a stunningly beautiful woman. Her investigation is going nowhere. Is the Pentagon stonewalling her? Or doesn't she really want to find the killer? 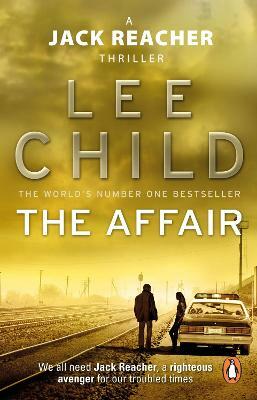 The adrenaline-pumping, high-voltage action in The Affair is set just six months before the opening of Killing Floor , and it marks a turning point in Reacher's career. If he does what the army wants, will he be able to live with himself? And if he doesn't, will the army be able to live with him? Is this his last case in uniform? Lee Child is one of the world's leading thriller writers. He was born in Coventry, raised in Birmingham, and now lives in New York. It is said one of his novels featuring his hero Jack Reacher is sold somewhere in the world every nine seconds. His books consistently achieve the number-one slot on bestseller lists around the world, and are published in over one hundred territories. He is the recipient of many prizes, most recently the CWA's Diamond Dagger for a writer of an outstanding body of crime fiction. Jack Reacher, the first Jack Reacher movie starring Tom Cruise, was based on the novel One Shot, and the second is Jack Reacher: Never Go Back.